In literary terms, few things scream ‘’Christmas’’ like a short stories collection. Along with ghost tales, short stories capture the literary spirit of Christmas in terms of atmosphere, customs, feelings. From Dickens – the man who created Christmas as we’ve come to know it- to contemporary writers, Christmas has inspired monumental moments in Literature. The family gatherings, dysfunctional or loving. The carols, the snow that covers cities, towns, and villages. The people who adore the holidays, those who try to impress and the ones who are less fortunate and let Christmas pass them by. This is the festive mise-en-scène of the 13 stories in A Vintage Christmas. 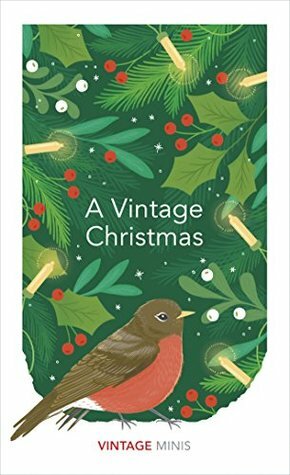 Carol-Barking from Cider With Rosie by Laurie Lee: A tender chapter on carols, wishes and teenage competition. Obadiah Oak, Mrs Griffiths and the Carol Singers from Notwithstanding by Louis de Bernières: A sad story about a bitter woman who spent her entire life sulking and distancing herself from every joy. The Turkey Season from The Moon of Jupites by Alice Munro: A story about turkeys and coming of age in a narrow-minded society. This one was disappointing. Tasteless, crude, borderline disgusting. I don’t think that this story should have been included in this collection. Christmas at Thompson Hall by Anthony Trollope: I think most of us women know that simple flu or the common cold seem like signs of imminent death to most men. They are not the most patients creatures when it comes to illness. In this marvelous story, a young wife tries to soothe her hypochondriac husband’s ‘’suffering’’ and gets herself in trouble. Christmas Shopping from The Green Road by Anne Enright: An over-stressed woman prepares for the extravagance of a very particular Christmas dinner. Conscience Pudding from The New Treasure Seekers by Edith Nesbit: The custom of the Christmas pudding goes horribly wrong for four children in this comic and melancholic story. Christmas at Cold Comfort Farm by Stella Gibbons: A funny and picturesque chapter but the Sussex idiom was too distracting and reading this proved a struggle. There Never Was Such a Goose from A Christmas Carol by Charles Dickens: The beloved figure of Tiny Tim is enough to bring tears in our eyes. The quirky ghost of Christmas Present shows Scrooge that life can be beautiful even in poverty and hardships. As long as you have love in your heart. Let Nothing You Dismay by Helen Simpson: A story that is the epitome of some serious humbug! I’m sorry but this abomination shouldn’t have found itself in the company of Dickens and Trollope. Christmas is a Sad Season for the Poor by John Cheever: A sad story about the unique ways in which people can be kind and cruel to each other. About the darker side of Christmas, the loneliness and isolation. A Serious Talk from What We Talk About When We Talk About Love by Raymond Carver: A very sad occasion of an extremely dysfunctional couple. Many thanks to Random House UK and NetGalley for the ARC in exchange for an honest review. For reasons I don’t understand, I seldom read Christmas books. I am very glad you liked this collection overall.